The Penske Racing Museum showcases a collection of cars, trophies and racing memorabilia and chronicles the career of one of the most successful sports dynasties. Roger S. Penske, a winning racer in the late 1950s, Penske was named 1961’s Sports Car Club of America Driver of the Year by Sports Illustrated. After retiring from driving, he created one of the most successful teams in IndyCar Series and NASCAR racing. Penske racing has more than forty years of racing experience and more than 250 major race wins highlighted by Fifteen Indianapolis 500-mile race victories. The museum features a collection of Indy 500 winning cars surpassed only by the Indianapolis Motor Speedway Hall of Fame Museum. The tops of several cars are open so car lovers can linger over the high-tech interior. On display in the museum is a replica of the 1963 Pontiac Catalina which Roger Penske drove to victory in the 1963 Riverside 250 along with the 2006 Dallara Honda which Sam Hornish Jr. drove to win the 2006 Indy 500. 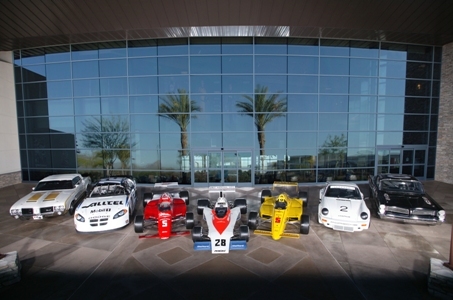 Several legendary race cars are on display. The 1974 Penske PC-1 was driven by Mark Donohue. This car was designed by Geoff Ferris and built at the Penske Cars, Ltd. shop in Dorset, England. The Hurst/Olds Cutlass 1972 Indianapolis 500 Pace car is also on display. The 1985 Penske March 85C 1985 Indianapolis 500 Winner was driven by Danny Sullivan. The “Spin and Win” car, driven by Danny Sullivan in 1985, won Penske Racing’s 5th Indy 500. The Penske PC-17 1988 Indianapolis 500 winner was driven by Rick Mears. The 1973 Porsche IROC RSR was driven by Mark Donohue and the 1963 NASCAR Pontiac Catalina (replica) was driven by Roger Penske. The 1977 Penske PC-5, driven by Tom Sneva, is the first car to hold the single lap qualifying record of more than 200 mph at the Indianapolis 500 and the first time Penske Racing campaigned their own chassis at the Indy 500. The 1994 Indianapolis 500 winner was driven by Al Unser Jr. The 2002 Dallara IR2 Indianapolis 500 winner, driven by Helio Castroneves, was Penske Racing’s 12th Indy 500 win and Castroneves’ second. It marked the first time a driver won the Indianapolis 500 in his first two Indy 500 starts. The 1991 Indianapolis 500 winner was driven by Rick Mears. The Museum’s Boutique offers Penske Racing merchandise including die cast cars and books as well as apparel for women, men and children. T-shirts, pens and one of a kind car parts, signed by Penske Team drivers, are available for purchase. The Turn 4 Café offers a variety of breakfast and lunch options ranging from bagels and breakfast sandwiches to freshly made salads and hot or cold sandwiches. Visitors can enjoy meals inside the café where Penske Racing displays their winning trophies from over the years or on the mezzanine overlooking the test track and the Land Rover off-road course.